In 2014, India’s Prime Minister Narendra Modi announced a goal to increase solar power capacity to 100 gigawatts (GW) by 2022—five times higher than the previous target. The 2022 target is extremely ambitious (the world’s total installed solar power capacity was 181 GW in 2014) and would make India a global leader in renewable energy. Moreover, Piyush Goyal, India’s Minister of State (IC) for Power, Coal and New & Renewable Energy, recently said that India aims to achieve its 100 GW solar target as early as the end of 2017. The question is: Is this target achievable? India’s total installed solar power capacity stands at 5.8 GW, so the country will need to significantly ramp up the pace of solar capacity additions, from an average 4 GW per year to 15+ GW per year to meet the 2022 target. Critics have been skeptical, citing hurdles like poor transmission infrastructure and lack of access to finance. Yet recent signs show that the country is starting to make serious progress on how it will achieve its lofty solar goals. 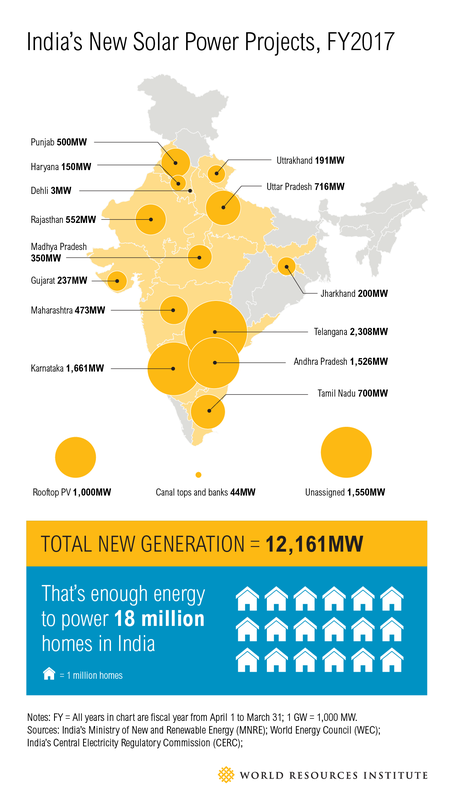 Goyal’s remarks came on the heels of last month’s release of India’s ambitious year-on-year solar capacity targets, which chart a roadmap for achieving the country’s 2022 goal. This sequence of yearly targets—as opposed to an assumed growth trend between current capacity and targeted capacity—shows that India is making concerted plans to reach its goals. These annual targets promote transparency, allowing stakeholders to hold the government accountable should they fall short. They also drive ambition, and often prove to be successful instruments for mobilizing finance at a faster rate. According to the targets, India will add 12 GW of new solar power capacity this fiscal year, and add 15 GW and 16 GW of new solar capacity in FY2018 and FY2019, respectively. This will also bring the country closer to the government’s commitment of providing 24-hour electricity to all Indians by 2019. 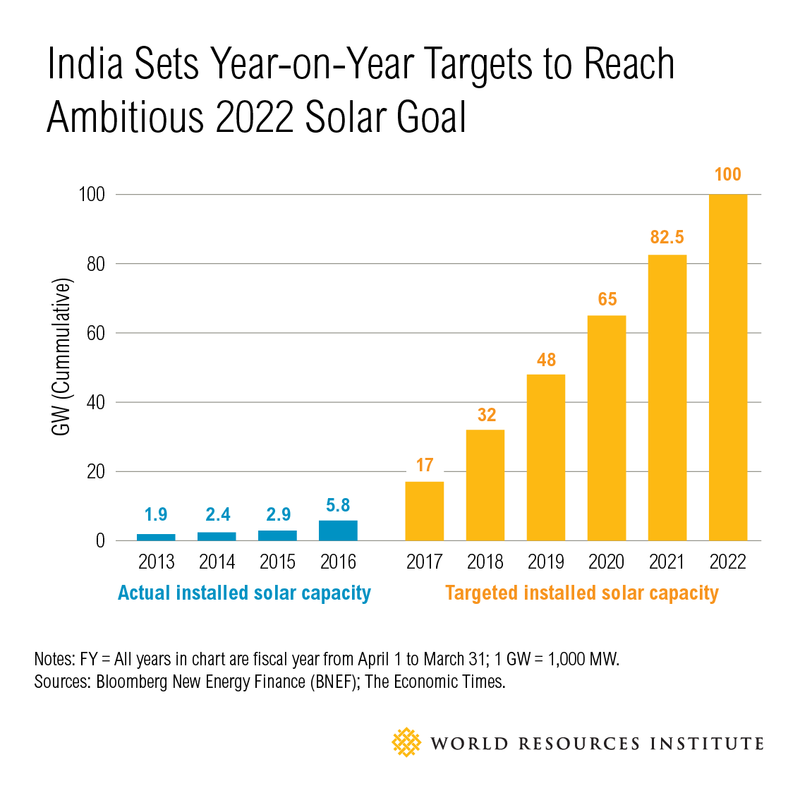 India looks set to reach its annual solar capacity addition target for this fiscal year. The Ministry of New & Renewable Energy has already approved the installation of 15 GW of new solar projects, of which 12 GW is likely to be in operation before March 2017. The states of Telangana, Karnataka and Tamil Nadu will see the largest solar capacity additions this financial year (collectively contributing to more than a third of new capacity additions in FY2017). While the majority of these new projects will be “ground-based,” utility scale grid-connected solar parks (with government encouraging the use of waste land for the development of these parks), 1 GW of new solar power capacity will be added to rooftops dotted across the country. India also plans to install 44 MW of solar PV on canal tops and banks, a novel concept that was first piloted in Gujarat in 2012. Canal-top solar power projects have the dual advantage of little to no requirement of land to set up the solar panels, as well as limiting the evaporation of water from canals and reservoirs. India is also taking steps to address issues of financially unviable state electricity retailers and an inadequate grid. For example, the Green Energy Corridor (GEC)—an initiative conceptualized and executed by the POWERGRID Corporation of India Limited and other state transmission utilities—will commission new transmission infrastructure to allow more renewables to be put on the grid, while at the same time tackling problems with power intermittency. The project has been making steady progress across different states like Andhra Pradesh, Rajasthan and Tamil Nadu. In a similar vein, the Central Electricity Regulatory Commission (CERC) has issued supportive regulations to increase transmission capacity, another move that will support more renewable energy on the grid. Finally, the recently announced UDAY scheme will provide a lifeline to state power distribution companies by improving their operational efficiencies (through measures such as smart metering) while at the same time reducing their debt interest rate. This will provide much-needed relief to these companies, who are ailing financially due to large-scale power theft, high costs of coal, inefficient operations and poor billing practices. Although India is on track to achieve its annual solar capacity addition target for this financial year, the government will need to do more in subsequent years to ensure that its targets are met. This is important not only for its solar commitment, but also for its national energy and climate change commitments–installing 175 GW of total renewable power capacity by 2022, and increasing the share of non-fossil-based power capacity from 30 percent today to about 40 percent by 2030 (with the help of international support). While the Indian government has taken positive steps to support the supply of solar on the grid, it should now also focus its attention on the demand for solar energy, by developing solutions that provide the private sector with access to affordable solar. These solutions must support distributed and off-grid generation systems, as well as the adoption of storage technologies—both of which are necessary to reach India’s ambitious solar goals. i India’s fiscal year runs from 1 April through 31 March.